The Spirit of Tea Tour officially began this last Thursday, September 28. 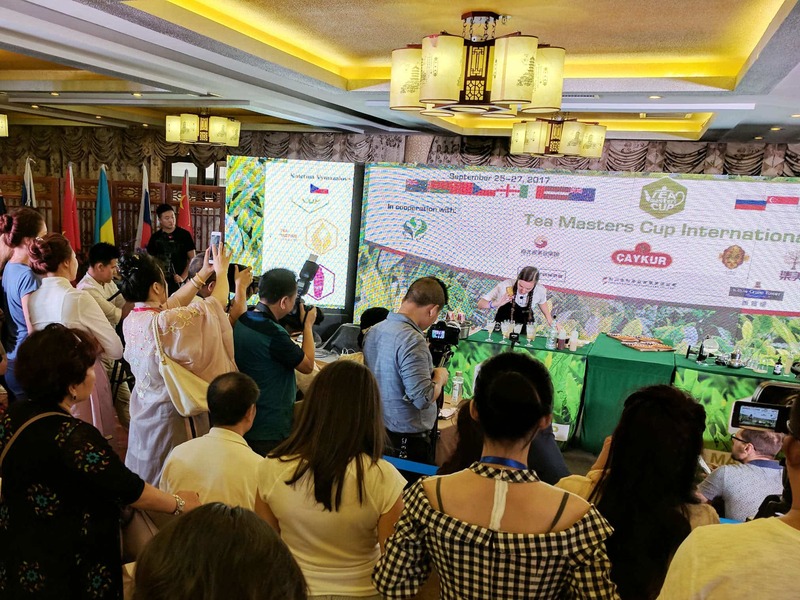 Unceremoniously, but with excitement and vigor, Spirit Tea conducted their Tea Dialing-In Workshop and later hosted a Matcha Latte Art Throwdown. I attended both and can gladly report that at least someone is talking about tea properly. I arrived at Steelhead Coffee in Long Beach, California that Thursday afternoon and was greeted by Taylor Cowan and Jordan Scherer, co-founders of Spirit Tea. These guys are huggers, so after a warm few affectionate squeezes, we jumped into talking about the teas they were going to test out that day. Jordan told me to look out for an unusual tea we’d be tasting, a good start to any tasting session. Anastasia Koba, from beverage tech company Marco, their partner on the Tour, was setting up the Marco Mix boiler behind the bar. Daniel Mendoza, Spirit’s west coast representative, was snapping pics for the web. The bright, minimalist coffee shop was, in many ways, the ideal place to begin the Tour. Steelhead has two locations in Long Beach and a third in Laguna Hills and serves as one of the main places in these locales to work on pro equipment, brew coffee expertly, and feature a rotating roster of coffee roasters, both local and from other parts of the country. When I visited, they eagerly had me taste a washed/natural-processed blend of Ethiopian coffee they were brewing as espresso (from Huckleberry Coffee, another stop along the Spirit of Tea Tour in Denver), a unique choice for any coffee bar. In tea terms, this would be like swapping out your traditional house matcha for a blend of traditional tencha cut with a bunch of powdered Tai Ping Hou Kui. In other words, they are very particular about their ingredients and use unusual blends to create familiar, but distinctive flavor profiles. In addition to their coffee lineup, Steelhead serves a handful of Spirit’s teas so it was a natural place to start the Tea Tour. Taylor (fore) preaching and Jordan brewing (back). This is an important point and goes back to what Jordan told me when they were planning all of this: “Coffee shops are currently where an elevated discussion around proper extraction is already taking place. This material is high level and we are seeking allies to help create more enthusiasm around tea.” Steelhead prides itself on presenting a professional coffee program for their local community. Frankly, coffeeshops care about the science of extraction in beverages and you can find a dozen in any given city that are solidly “third-wave”, that is, committed to expertly brewing your coffee. So, where are the tea shops that are this serious? What tea company is creatively refining their products and promoting quality and craft on par with those spear-heading the third-wave coffee movement? Spirit Tea is that company. And where better to build excitement than in a coffee shop where the values of preparing exceptional products seamlessly blend with Spirit Tea’s own philosophy about tea? Taylor prepped the opening presentation on a laptop and gathered around the dozen or so people in attendance. Not a huge turnout, but the Tour was just beginning and as mentioned, you need to start the conversation before people will join in. And just like that, the workshop began. I don’t want to give anything too specific away, mostly because I’d love if everyone went and experienced it themselves, but there was talk of the chemical composition of tea, the components you’re looking for when properly extracting tea, and a few charts and graphs (like this one, perhaps?). After the knowledge section, we got to the hands-on dialing-in segment. Jordan introduced us to a few teas to open up our palates and explained that his motivation in sourcing this year was a bit more experimental. In effect, he wanted to find teas that are were processed atypically. There was no clearer example of this than their Tie Guan Yin (Iron Goddess of Mercy), normally a wulong, processed as a black tea. The leaves are thick and wiry, with a dusty black hue and a warm umber infusion. This was the crowd favorite going into the blind dial-in. Again, without spoiling the fun, we spent a good 30 minutes figuring out what tea we were presented with and how to best brew it. Of course, we played with the time and temperature variables, and this was made easier by the Marco machine they brought along. Temperature is typically the most difficult part to control for in a group setting, especially when brewing back-to-back. In the end, we drank a gallon of amazing tea, and it seemed self-evident that everyone left a bit more enlightened, physical and mental thirsts quenched. Mere hours after Taylor and Jordan were preaching the tea gospel in Long Beach, they were setting up for a latte-art throwdown in the Arts District of Downtown Los Angeles, at Cafe Dulce (“Dos” as it’s also known, it being their second location). Having previously worked in the area, I can tell you that there’s nary a better place than the Arts District to host such a tried-and-true trope as the latte art throwdown. Taylor (left), Jordan (far right, back), and competitors. Cafe Dulce (Dos) is located in a brand new development known as ROW DTLA. A former manufacturing area, ROW took this massive collection of warehouses and repurposed them into a blooming, walkable city block of industry. Dulce’s space is expansive, inviting, and appears custom-built for the curious barista within us all. With all manner of brewing equipment stocked behind their bar, including an über-hip, American-made Slayer Espresso Machine, they too take passion in the coffee they source and serve. As the baristas started to pour in, it was clear that this would be a much larger event than the first. After all, baristas are known to like a few things: cool hats, facial hair and/or plaid, beer (plenty of beer was brought, IPA obviously), and latte art competitions. (For the record, I also like these things…) But a matcha latte art competition? I’ve never seen that, other than being featured as a curveball in a traditional latte art throwdown. The novelty might have been a driving lure. Taylor practiced his matcha whisking, Jordan chatted up the owner of the cafe, Daniel took more photos, and Anastasia agreed to be one of the judges, along with one of Dulce’s pro baristas and John, the owner of Steelhead Coffee. I was asked to partially MC the event (last minute!). I had, after all, been incredibly supportive of their efforts. It was my duty to oblige. Lest you think I had no horse in this race and was an impartial host, I brought not one, but three competitors to give everyone a run for their money…their literal money: Third Place received a coffee starter-set complete with an AeroPress, Second Place received matcha starter kit, and First Place got $200 cash money. Twenty competitors signed up and after two grueling sweat and milk-stained hours, it was finished. Even with prior warning, it was a very real challenge for the baristas to pour beautiful matcha lattes. Matcha is a much different, much more fickle beast to tackle than espresso when pouring art, and it surprised a lot of competitors. Fates were decided, honor was tested, and dreams were crushed, but in the end, Matthew Gasaway came away the victor. Matthew is a long-time coffee pro and has worked for Intelligentsia Coffee for years. He’s also, coincidentally, a dear friend of Taylor’s. Be sure to catch their upcoming events on the Tea Tour in Denver, Portland, and Seattle. I’ll definitely be joining in Seattle! I’m sure they’ll be delighted! Are you competing? Have fun!